27 publications with the keyword "active contours"
Deformable and articulated objects are hard to segment and track over time. Purely motion based techniques such as optical flow can produce good results in terms of segmenting motion, however they do not incorporate salient object features. In this work, we propose a textured object segmentation method using temporal coherency in videos. We utilize color and texture feature fusion within a fast globally convex active contour method to obtain multiscale intra frame segmentations. A long distance optical flow based point trajectories is then combined with frame segmentations to obtain label propagation along the temporal direction. Total variation regularization is applied to obtain well-defined object boundaries and a dual minimization implementation is undertaken for solving the overall energy minimization. Preliminary experimental results shows that we obtain dense segmentations even with sparse and noisy initial label sets. keywords = "segmentation, videos, active contours"
V. B. S. Prasath, R. Pelapur, K. Palaniappan, and G. Seetharaman. 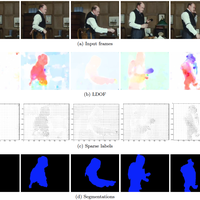 Textured object video segmentation using temporal coherency. Proc. SPIE Conf. Geospatial Informatics, Fusion, and Motion Video Analytics VI, 2016. Multiphase active contour based models are useful in identifying multiple regions with spatial consistency but varying characteristics such as the mean intensities of regions. 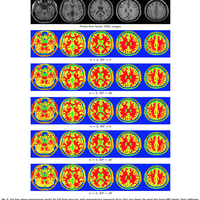 Segmenting brain magnetic resonance images (MRIs) using a multiphase approach is useful to differentiate white and gray matter tissue for anatomical, functional and disease studies. Multiphase active contour methods are superior to other approaches due to their topological flexibility, accurate boundaries, robustness to image variations and adaptive energy functionals. Globally convex methods are furthermore initialization independent. We extend the relaxed globally convex Chan and Vese two-phase piecewise constant energy minimization formulation of Chan et al. (2006)  to the multiphase domain and prove the existence of a global minimizer in a specific space which is one of the novel contributions of the paper. An efficient dual minimization implementation of our binary partitioning function model accurately describes disjoint regions using stable segmentations by avoiding local minima solutions. Experimental results indicate that the proposed approach provides consistently better accuracy than other related multiphase active contour algorithms using four different error metrics (Dice, Rand Index, Global Consistency Error and Variation of Information) even under severe noise, intensity inhomogeneities, and partial volume effects in MRI imagery. J. C. Moreno, V. B. S. Prasath, H. Proenca, and K. Palaniappan. Fast and globally convex multiphase active contours for brain MRI segmentation. 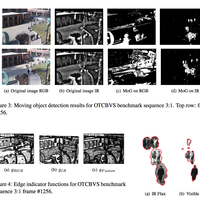 Computer Vision and Image Understanding, volume 125, pages 237-250, August 2014. We study an efficient texture segmentation model for multichannel videos using a local feature fitting based active contours scheme. We propose a flexible motion segmentation approach using features computed from texture, intensity components in a globally convex continuous optimization and fusion framework. A fast numerical implementation is described using an efficient dual minimization formulation and experimental results on synthetic and real color videos indicate the superior performance of the proposed method compared to related approaches. The novel contributions include the use of local feature density functions in the context of a luminance-chromaticity decomposition combined with a globally convex active contour variational method to capture texture variations for video object segmentation. V. B. S. Prasath, R. Pelapur, K. Palaniappan, and G. Seetharaman. Feature fusion and label propagation for textured object video segmentation. Proc. SPIE Conf. Geospatial InfoFusion and Video Analytics IV; and Motion Imagery for ISR and Situational Awareness II (Defense, Security and Sensing), volume 9089, 2014. Z. Hong, I. Ersoy, M. Sun, F. Bunyak, P. Hampel, Z. Hong, Z. Sun, Z. Li, I. Levitan, G. A. Meininger, and K. Palaniappan. Influence of membrane cholesterol and substrate elasticity on endothelial cell spreading behavior. J. Biomedical Material Research Part A, 2013. Wireless capsule endoscopy (WCE) provides an inner view of the human digestive system. The inner tubular like structure of the intestinal tract consists of two major regions: lumen - intermediate region where the capsule moves, mucosa - membrane lining the lumen cavities. We study the use of the Split Bregman version of the extended active contour model of Chan and Vese for segmenting mucosal regions in WCE videos. Utilizing this segmentation we obtain a 3D reconstruction of the mucosal tissues using a near source perspective shape-from- shading (SfS) technique. Numerical results indicate that the active contour based segmentation provides better segmenta- tions compared to previous methods and in turn gives better 3D reconstructions of mucosal regions. V. B. S. Prasath, I. Figueiredo, P. Figueiredo, and K. Palaniappan. Mucosal region detection and 3D reconstruction in wireless capsule endoscopy videos using active contours. 34th IEEE Engineering in Medicine and Biology Society Conf. (EMBC), pages 4014--4017, 2012. Computer-Aided Diagnosis (CAD) systems for pathologists can act as an intelligent digital assistant supporting automated grading and morphometric-based discovery of tissue features that are important in cancer diagnosis and patient prognosis. Automated image segmentation is an essential com- ponent of computer-based grading in CAD. We describe a novel tissue segmentation algorithm using local feature-based active contours in a globally convex formulation. Preliminary results using the Stanford Tissue MicroArray database shows promising stromal/epithelial superpixel segmentation. keywords = "histopathology, active contours, classification, features, texture, machine learning, data mining, biomedical"
V. B. S. Prasath, F. Bunyak, P. Dale, S. R. Frazier, and K. Palaniappan. Segmentation of breast cancer tissue microarrays for computer-aided diagnosis in pathology. IEEE Healthcare Innovation Conference, 2012. We study an efficient texture image segmentation model for multichannel images using a local feature fitting based active contours scheme. 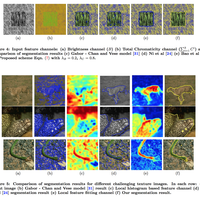 Using a chromaticity-brightness decom- position, we propose a flexible segmentation approach us- ing multi-channel texture and intensity in a globally convex continuous optimization framework. We make use of local feature histogram based weights with the smoothed gradi- ents from the brightness channel and localized fitting for the chromaticity channels. A fast numerical implementation is described using an efficient dual minimization formulation and experimental results on synthetic and real color images indicate the superior performance of the proposed method compared to related approaches. 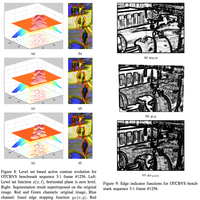 The novel contributions include the use of local feature density functions in the con- text of a luminance-chromaticity decomposition combined with a globally convex active contour variational method to capture texture variations for image segmentation. V. B. S. Prasath, K. Palaniappan, and G. Seetharaman. Multichannel texture image segmentation using local feature fitting based variational active contours. 8th Indian Conference on Computer Vision, Graphics and Image Processing (ICVGIP), 2012. High resolution, multispectral, and multimodal imagery of tissue biopsies is an indispensable source of information for diagnosis and prognosis of diseases. Automatic extraction of relevant features from these imagery is a valuable assistance for medical experts. A primary step in computational histology is accurate image segmentation to detect the number and spatial distribution of cell nuclei in the tissue, along with segmenting other structures such as lumen and epithelial regions which together make up a gland structure. 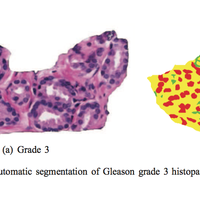 This chapter presents an automatic segmentation system for histopathology imaging. Spatial constraint fuzzy C-means provides an unsupervised initialization. An active contour algorithm that combines multispectral edge and region informations through a vector multiphase level set framework and Beltrami color metric tensors refines the segmentation. An improved iterative kernel filtering approach detects individual nuclei centers and decomposes densely clustered nuclei structures. The obtained results show high performances for nuclei detection compared to the human annotation. F. Bunyak, A. Hafiane, and K. Palaniappan. 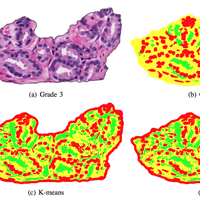 Histopathology tissue segmentation by combining fuzzy clustering with multiphase vector level sets. Software Tools and Algorithms for Biological Systems, Springer, pages 413--424, 2011. We present multi-phase FastGPAC that extends our dramatic improvement of memory requirements and computational complexity on two-class GPAC, into multi-class image segmentation. Graph partitioning active contours GPAC is a recently introduced approach that elegantly embeds the graph-based image segmentation problem within a continuous level set-based active contour paradigm. However, GPAC similar to many other graph-based approaches has quadratic memory requirements. For example, a 1024x1024 grayscale image requires over one terabyte of working memory. Approximations of GPAC reduce this complexity by trading off accuracy. Our FastGPAC approach implements an exact GPAC segmentation using constant memory requirement of few kilobytes and enables use of GPAC on high throughput and high resolution images. Extension to multi-phase enables segmention of multiple regions of interest with different appearances. We have successfully applied FastGPAC on different types of images, particularly on biomedical images of different modalities. Experiments on the various image types, natural, biomedical etc. show promising segmentation results with substantially reduced computational requirements. F. Bunyak and K. Palaniappan. Level set-based fast multi-phase graph partitioning active contours using constant memory. Lecture Notes in Computer Science (ACIVS), volume 5807, pages 145--155, 2009. We present a method to improve the accuracy and speed, as well as significantly reduce the memory requirements, for the recently proposed Graph Partitioning Active Contours (GPACs) algorithm for image segmentation in the work of Sumengen and Manjunath (2006). Instead of computing an approximate but still expensive dissimilarity matrix of quadratic size, (Ns2Ms2)/(nsms), for a 2D image of size Ns ×Ms and regular image tiles of size ns ×ms , we use fixed length histograms and an intensity-based symmetric- centrosymmetric extensor matrix to jointly compute terms associated with the complete NsMs × NsMs dissimilarity matrix. This computationally efficient reformulation of GPAC using a very small memory footprint offers two distinct advantages over the original implementation. It speeds up convergence of the evolving active contour and seamlessly extends performance of GPAC to multidimensional images. S. K. Nath and K. Palaniappan. 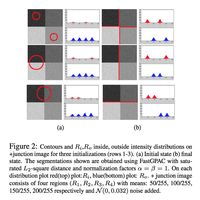 Fast graph partitioning active contours for image segmentation using histograms. EURASIP Journal on Image and Video Processing, pages 9p, 2009. Graph partitioning active contours (GPAC) is a recently introduced approach that elegantly embeds the graph-based image segmentation problem within a continuous opti- mization framework. GPAC can be used within paramet- ric snake-based or implicit level set-based active contour continuous paradigms for image partitioning. However, GPAC similar to many other graph-based approaches has quadratic memory requirements which severely limits the scalability of the algorithm to practical problem domains. An N ×N image requires O(N4) computation and memory to create and store the full graph of pixel inter-relationships even before the start of the contour optimization process. For example, an 1024x1024 grayscale image needs over one terabyte of memory. Approximations using tile/block- based or superpixel-based multiscale grouping of the pixels reduces this complexity by trading off accuracy. 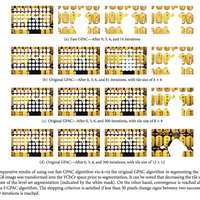 This paper describes a new algorithm that implements the exact GPAC algorithm using a constant memory requirement of a few kilobytes, independent of image size. F. Bunyak and K. Palaniappan. Efficient segmentation using feature-based graph partitioning active contours. 12th IEEE Int. Conf. Computer Vision, pages 873--880, 2009. The large amount of data produced by biological live cell imaging studies of cell behavior requires accurate automated cell segmentation algorithms for rapid, unbiased and reproducible scientific analysis. This paper presents a new approach to obtain precise boundaries of cells with complex shapes using ridge measures for initial detection and a modified geodesic active contour for curve evolution that exploits the halo effect present in phase-contrast microscopy. The level set contour evolution is controlled by a novel spatially adaptive stopping function based on the intensity profile perpendicular to the evolving front. The proposed approach is tested on human cancer cell images from LSDCAS and achieves high accuracy even in complex environments. I. Ersoy, F. Bunyak, M. A. Mackey, and K. Palaniappan. 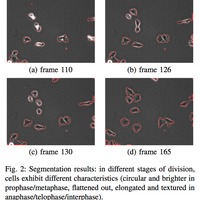 Cell segmentation using Hessian-based detection and contour evolution with directional derivatives. IEEE Int. Conf. Image Processing, pages 1804--1807, 2008. Histopathology imaging provides high resolution multispec- tral images for study and diagnosis of various types of cancers. The automatic analysis of these images can greatly facilitate the diagnosis task for pathologists. A primary step in computational histology is accu- rate image segmentation to detect the number and spatial distribution of cell nuclei in the tissue, along with segmenting other guiding struc- tures such as lumen and epithelial regions which together make up a gland structure. This paper presents a new method for gland structure segmentation and nuclei detection. In the first step, fuzzy c-means with spatial constraint algorithm is applied to detect the potential regions of interest, multiphase vector-based level set algorithm is then used to refine the segmentation. Finally, individual nucleus centers are detected from segmented nuclei clusters using iterative voting algorithm. The ob- tained results show high performances for nuclei detection compared to the human annotation. A. Hafiane, F. Bunyak, and K. Palaniappan. 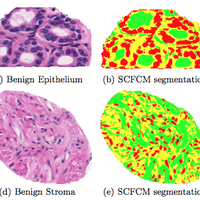 Fuzzy clustering and active contours for histopathology image segmentation and nuclei detection. Lecture Notes in Computer Science (ACIVS), volume 5259, pages 903--914, 2008. Cell adhesion and spreading within the extracellular matrix (ECM) plays an important role in cell motility, cell growth and tissue organization. Measuring cell spreading dynamics enables the investigation of cell mechanosensitivity to external mechanical stimuli, such as substrate rigidity. A common approach to measure cell spreading dynamics is to take time lapse images and quantify cell size and perimeter as a function of time. In our experiments, differences in cell characteristics between different treatments are subtle and require accurate measurements of cell parameters across a large population of cells to ensure an adequate sample size for statistical hypothesis testing. This paper presents a new approach to estimate accurate cell boundaries with complex shapes by applying a modified geodesic active contour level set method that directly utilizes the halo effect typically seen in phase contrast microscopy. Contour evolution is guided by edge profiles in a perpendicular direction to ensure convergence to the correct cell boundary. 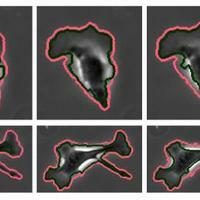 The proposed approach is tested on bovine aortic endothelial cell images under different treatments, and demonstrates accurate segmentation for a wide range of cell sizes and shapes compared to manual ground truth. I. Ersoy, F. Bunyak, K. Palaniappan, M. Sun, and G. Forgacs. Cell spreading analysis with directed edge profile-guided level set active contours. Lecture Notes in Computer Science (MICCAI), volume 5241, pages 376--383, 2008. Computer assisted or automated histological grad- ing of tissue biopsies for clinical cancer care is a long- studied but challenging problem. It requires sophis- ticated algorithms for image segmentation, tissue ar- chitecture characterization, global texture feature ex- traction, and high-dimensional clustering and classi- fication algorithms. Currently there are no automatic image-based grading systems for quantitative pathol- ogy of cancer tissues. 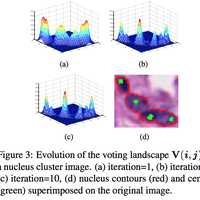 We describe a novel approach for tissue segmentation using fuzzy spatial clustering, vector-based multiphase level set active contours and nuclei detection using an iterative kernel voting scheme that is robust even in the case of clumped touching nu- clei. Early results show that we can reach a 91% detec- tion rate compared to manual ground truth of cell nuclei centers across a range of prostate cancer grades. A. Hafiane, F. Bunyak, and K. Palaniappan. Clustering initiated multiphase active contours and robust separation of nuclei groups for tissue segmentation. IEEE Int. Conf. Pattern Recognition, pages Online, 2008. 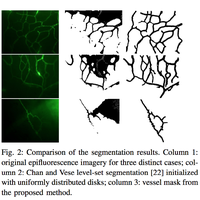 Accurate vessel segmentation is the first step in analysis of microvascular networks for reliable feature extraction and quantitative characterization. Segmentation of epifluorescent imagery of microvasculature presents a unique set of challenges and opportunities compared to traditional angiogram-based vessel imagery. This paper presents a novel system that combines methods from mathematical morphology, differential geometry, and active contours to reliably detect and segment microvasculature under varying background fluores- cence conditions. The system consists of three main modules: vessel enhancement, shape-based initialization, and level-set based segmentation. Vessel enhancement deals with image noise and uneven background fluorescence using anisotropic diffusion and mathematical morphology techniques. Shape-based initial- ization uses features from the second-order derivatives of the enhanced vessel image and produces a coarse ridge (vessel) mask. Geodesic level-set based active contours refine the coarse ridge map and fix possible discontinuities or leakage of the level set contours that may arise from complex topology or high background fluorescence. The proposed system is tested on epifluorescence-based high resolution images of porcine dura mater microvasculature. Preliminary experiments show promising results. F. Bunyak, K. Palaniappan, O. Glinskii, V. Glinskii, V. Glinsky, and V. Huxley. Epifluorescence-based quantitative microvasculature remodeling using geodesic level-sets and shape-based evolution. 30th IEEE Engineering in Medicine and Biology Society Conf. (EMBC), pages 3134--3137, 2008. 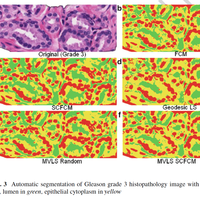 Automated histological grading of tissue biopsies for clinical cancer care is a challenging problem that requires sophisticated algorithms for image segmentation, tissue archi- tecture characterization, global texture feature extraction, and high-dimensional clustering and classification algorithms. Cur- rently there are no automatic image-based grading systems for establishing the pathology of cancer tissues. A primary step in computational histology is accurate image segmentation to detect significant regions such as nuclei, lumen and epithelial cytoplasm which together make up a gland structure. We describe a new approach for tissue segmentation using fuzzy spatial clustering and level set active contours. 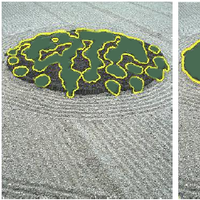 The proposed technique shows improvement in segmentation accuracy and outperform the classical clustering and level set methods, when compared to ground truth segmentation. A. Hafiane, F. Bunyak, and K. Palaniappan. 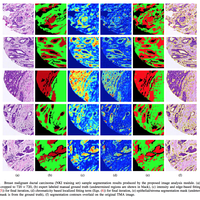 Level-set-based histology image segmentation with region-based comparison. MICCAI Workshop MIAAB, pages Online, 2008. 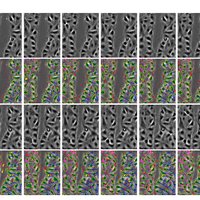 Cell boundary segmentation in live cell image sequences is the first step towards quantitative analysis of cell motion and behavior. The time lapse microscopy imaging produces large volumes of image sequence collections which requires fast and robust automatic segmentation of cell bound- aries to utilize further automated tools such as cell tracking to quantify and classify cell behavior. 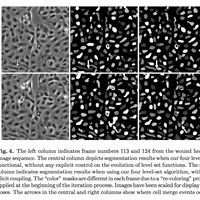 This paper presents a methodology that is based on utilizing the temporal context of the cell image sequences to accurately delineate the boundaries of non-homogeneous cells. A novel flux tensor-based detection of moving cells provides initial localization that is further refined by a multi-feature level set-based method using an efficient additive operator splitting scheme. 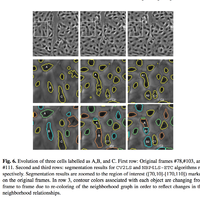 The segmentation result is processed by a watershed-based algorithm to avoid merging boundaries of neighboring cells. By utilizing robust features, the level-set algorithm produces accurate segmentation for non- homogeneous cells with concave shapes and varying intensities. I. Ersoy and K. Palaniappan. Multi-feature contour evolution for automatic live cell segmentation in time lapse imagery. 30th IEEE Engineering in Medicine and Biology Society Conf. (EMBC), pages 371--374, 2008. This paper makes new contributions in motion detection, object segmentation and trajectory estimation to create a successful object tracking system. A new efficient motion detection algorithm referred to as the flux tensor is used to detect moving objects in infrared video without requiring background modeling or contour extraction. The flux tensor-based motion detector when applied to infrared video is more accurate than thresholding ”hot-spots”, and is insensitive to shadows as well as illumination changes in the visible channel. In real world monitoring tasks fusing scene information from multiple sensors and sources is a useful core mechanism to deal with complex scenes, lighting conditions and environmental variables. The object segmentation algorithm uses level set-based geodesic active contour evolution that incorporates the fusion of visible color and infrared edge informations in a novel manner. Touching or overlapping objects are further refined dur- ing the segmentation process using an appropriate shape- based model. Multiple object tracking using correspondence graphs is extended to handle groups of objects and occlusion events by Kalman filter-based cluster trajectory analysis and watershed segmentation. 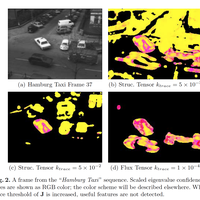 The proposed object tracking algorithm was successfully tested on several difficult outdoor multispectral videos from stationary sensors and is not confounded by shadows or illumination variations. F. Bunyak, K. Palaniappan, S. K. Nath, and G. Seetharaman. Flux tensor constrained geodesic active contours with sensor fusion for persistent object tracking. J. Multimedia, volume 2, issue 4, pages 20--33, August 2007. Many image segmentation approaches rely upon or are enhanced by using spatial relationship information between image regions and their object correspondences. Spatial relationships are usually captured in terms of relative neighborhood graphs such as the Delaunay graph. Neighborhood graphs capture information about which objects are close to each other in the plane or in space but may not capture complete spatial relationships such as containment or holes. Additionally, the typical approach used to compute the Delaunay graph (or its dual, the Voronoi polytopes) is based on using only the point-based (i.e., centroid) representation of each object. This can lead to incorrect spatial neighborhood graphs for sized objects with complex topology, eventually resulting in poor seg- mentation. This paper proposes a new algorithm for efficiently, and accurately ex- tracting accurate neighborhood graphs in linear time by computing the Hamilton- Jacobi generalized Voronoi diagram (GVD) using the exact Euclidean-distance transform with Laplacian-of-Gaussian, and morphological operators. 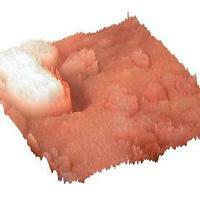 The algo- rithm is validated using synthetic, and real biological imagery of epithelial cells. S. K. Nath, K. Palaniappan, and F. Bunyak. 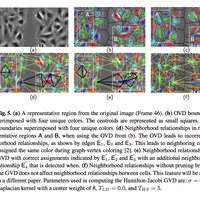 Accurate spatial neighborhood relationships for arbitrarily-shaped objects using Hamilton-Jacobi GVD. Lecture Notes in Computer Science (SCIA), volume 4522, pages 421--431, 2007. Persistent object tracking in complex and adverse envi- ronments can be improved by fusing information from mul- tiple sensors and sources. We present a new moving object detection and tracking system that robustly fuses infrared and visible video within a level set framework. We also in- troduce the concept of the flux tensor as a generalization of the 3D structure tensor for fast and reliable motion detec- tion without eigen-decomposition. The infrared flux tensor provides a coarse segmentation that is less sensitive to illu- mination variations and shadows. The Beltrami color met- ric tensor is used to define a color edge stopping function that is fused with the infrared edge stopping function based on the grayscale structure tensor. The min fusion operator combines salient contours in either the visible or infrared video and drives the evolution of the multispectral geodesic active contour to refine the coarse initial flux tensor mo- tion blobs. Multiple objects are tracked using correspon- dence graphs and a cluster trajectory analysis module that resolves incorrect merge events caused by under- segmen- tation of neighboring objects or partial and full occlusions. Long-term trajectories for object clusters are estimated us- ing Kalman filtering and watershed segmentation. We have tested the persistent object tracking system for surveillance applications and demonstrate that fusion of visible and in- frared video leads to significant improvements for occlusion handling and disambiguating clustered groups of objects. F. Bunyak, K. Palaniappan, S. K. Nath, and G. Seetharaman. Geodesic active contour based fusion of visible and infrared video for persistent object tracking. 8th IEEE Workshop Applications of Computer Vision (WACV 2007), pages Online, 2007. Time lapse video microscopy routinely produces terabyte sized biological image sequence collections, especially in high throughput environments, for unraveling cellular mechanisms, screening biomarkers, drug discovery, image-based bioinformatics, etc. Quantitative movement analysis of tissues, cells, organelles or molecules is one of the fundamental signals of biological importance. The accurate detection and segmentation of moving biological objects that are similar but non-homogeneous is the focus of this paper. The problem domain shares similarities with multimedia video analytics. The grayscale structure tensor fails to disambiguate between stationary and moving features without computing dense velocity fields (i.e. optical flow). In this paper we propose a novel motion detection algorithm based on the flux tensor combined with multi-feature level set-based segmentation, using an efficient additive operator splitting (AOS) numerical implementation, that robustly handles deformable motion of non-homogeneous objects. 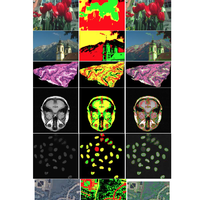 The flux tensor level set framework effectively handles biological video segmentation in the presence of complex biological processes, background noise and clutter. K. Palaniappan, I. Ersoy, and S. K. Nath. Moving object segmentation using the flux tensor for biological video microscopy. Lecture Notes in Computer Science (PCM), volume 4810, pages 483-493, 2007. Quantifying the behavior of cells individually, and in clus- ters as part of a population, under a range of experimental conditions, is a challenging computational task with many bi- ological applications. We propose a versatile algorithm for segmentation and tracking of multiple motile epithelial cells during wound healing using time-lapse video. The segmen- tation part of the proposed method relies on a level set-based active contour algorithm that robustly handles a large num- ber of cells. The tracking part relies on a detection-based multiple-object tracking method with delayed decision en- abled by multi-hypothesis testing. The combined method is robust to complex cell behavior including division and apop- tosis, and to imaging artifacts such as illumination changes. F. Bunyak, K. Palaniappan, S. K. Nath, T. I. Baskin, and G. Dong. Quantitative cell motility for in vitro wound healing using level set-based active contour tracking. IEEE Int. Symposium on Biomedical Imaging (ISBI), pages 1040--1043, April 2006. Understanding behavior of migrating cells is becoming an emerging research area with many important applications. Segmentation and tracking con- stitute vital steps of this research. In this paper, we present an automated cell segmentation and tracking system designed to study migration of cells imaged with a phase contrast microscope. For segmentation the system uses active con- tour level set methods with a novel extension that efficiently prevents false-merge problem. Tracking is done by resolving frame to frame correspondences between multiple cells using a multi-distance, multi-hypothesis algorithm. Cells that move into the field-of-view, arise from cell division or disappear due to apoptosis are reliably segmented and tracked by the system. Robust tracking of cells, imaged with a phase contrast microscope is a challenging problem due to difficulties in segmenting dense clusters of cells. As cells being imaged have vague borders, close neighboring cells may appear to merge. These false-merges lead to incor- rect trajectories being generated during the tracking process. Current level-set based approaches to solve the false-merge problem require a unique level set per object (the N-level set paradigm). The proposed approach uses evidence from previous frames and graph coloring principles and solves the same problem with only four level sets for any arbitrary number of similar objects, like cells. S. K. Nath, F. Bunyak, and K. Palaniappan. 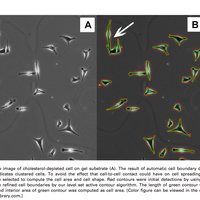 Robust tracking of migrating cells using four-color level set segmentation. Lecture Notes in Computer Science (ACIVS), Springer-Verlag, volume 4179, pages 920--932, 2006. Current level-set based approaches for segmenting a large number of objects are computationally expensive since they require a unique level set per object (the N-level set paradigm), or log2N level sets when using a multiphase interface tracking formulation. Incorpo- rating energy-based coupling constraints to control the topological in- teractions between level sets further increases the computational cost to O(N2). We propose a new approach, with dramatic computational sav- ings, that requires only four, or fewer, level sets for an arbitrary number of similar objects (like cells) using the Delaunay graph to capture spatial relationships. Even more significantly, the coupling constraints (energy- based and topological) are incorporated using just constant O(1) com- plexity. The explicit topological coupling constraint, based on predicting contour collisions between adjacent level sets, is developed to further prevent false merging or absorption of neighboring cells, and also reduce fragmentation during level set evolution. The proposed four-color level set algorithm is used to efficiently and accurately segment hundreds of in- dividual epithelial cells within a moving monolayer sheet from time-lapse images of in vitro wound healing without any false merging of cells. S. K. Nath, K. Palaniappan, and F. Bunyak. 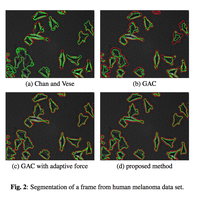 Cell segmentation using coupled level sets and graph-vertex coloring. Lecture Notes in Computer Science (MICCAI), volume 4190, pages 101--108, 2006. In this paper,a new method for motion flow estimation that considers errors in all the derivative measurements is presented.Basedonthetotalleastsquares(TLS)model,we accurately estimate the motion flow in the general noise case by combining noise model (in form of covariance matrix) with a parametric motion model. The proposed algorithm is tested on two different types of biological motion, a growing plant root and a gastrulating embryo, with sequences obtained microscopically. The local, instantaneous velocity field estimated by the algorithm revealsthebehavioroftheunderlyingcellularelements. G. Dong, T. I. Baskin, and K. Palaniappan. 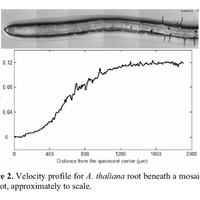 Motion flow estimation from image sequences with applications to biological growth and motility. IEEE Int. Conf. Image Processing, pages 1245--1248, 2006.